3. Various theme templates for Web Albums, Banner Slideshows, Photo Galleries, etc. 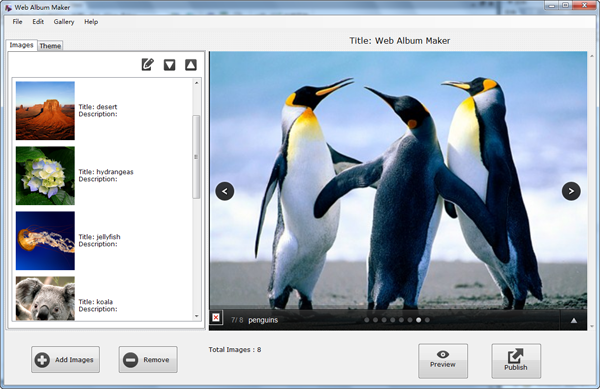 After launching Web Album Maker, click "Add Images" to locate photos from your PC and import them. Also you can drag photos to "Images" area directly. Photos in JPEG, TIFF, Bitmap, PNG and GIF formats are supported. 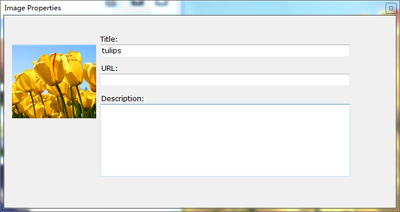 Once photos are added, you can "Edit" button to add titles, URL and descriptions for images. Click the Up/Down button to arrange photo order. If you want to remove a photo, click the "Remove" button. 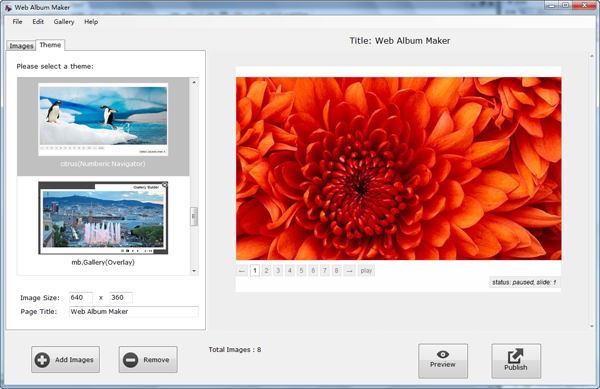 Switch to "Theme" tab to choose a jQuery theme for your web album, online photo gallery or banner slider. There are kinds of theme templates for choosing, such as bottom thumbnail theme, right thumbnail theme, bottom dot theme, slidder, pascal, orman and more. You can customize image size here too. Then Click the "Preview" button the view the effect of the photo gallery. After previewing the software, you can click "Publish" to publish the album gallery. In the output folder, there are photo folder and html file and css file. To use the photo gallery in your web pages, you need to copy all the files in the output folder to the same folder which your website is in, then cody and paste the html file code into your own web page.